Hi everyone, We are introducing a new author to CircuitsToday 🙂 Well, here meet Anish.K, a student in engineering from Anna University. He will cover topics on Embedded systems and Robotics mainly. You can read about Anish on his bio page. Anish will publish his articles every Tuesday. So stay tuned for yourÂ TuesdayÂ column every week. Hai, this article pictures the very basics of embedded system for a beginner. 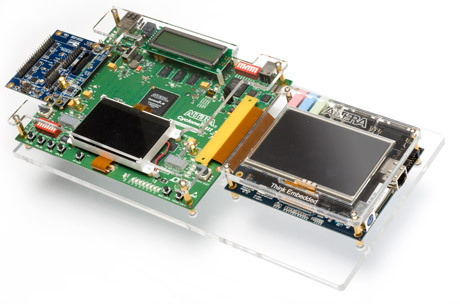 Embedded System – What is it? Â Â Â Whenever I hear the term â€œEmbedded Systemâ€, what comes to mind is â€œA combination of hardware and softwareâ€ as instructed at the colleges. Well, instead of calling it as merely a combination of hardware and software, it would be apt to define it as application specific, organized hardware, controlled by specific software in which the hardware and software are the components of the embedded system. And there are many versions of the definition of an embedded system which ultimately culminate as said above. â€œPartsâ€ of an embedded system? Â Â Â Mainly, the hardware components constitute power source, microcontroller/microprocessor, timers, memory, and whatever needed for running the specific task. And the software components constitute programs such as compilers, integrated development environments (IDE), assemblers, simulators etc., which are used to create codes that â€œinstructâ€ the hardware to do the assigned job in an efficient manner. Notable computer languages that are used for programming in embedded systems are embedded C, embedded C++, embedded JAVA and assembly. Here embedded C and others contain a specific library for a microcontroller to work. (Like the specific header files such as math.h, conio.h). Mostly, for simple applications, an assembly is used, which produces more efficient, compact codes. Some of the open-source operating systems used in embedded systems are Android, Microcontroller operating system (ÂµCOS), VS works. 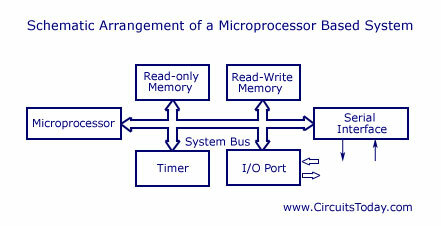 Â Â Microcontroller/microprocessor is analogous to the brain of the embedded system. It performs all the calculation and decision part of the process. You would be surprised to know that the only arithmetic operation the processor/controller is capable of doing is, addition! (and the modern computer too). Multiplication is repeated addition, subtraction is the addition of negative numbers and division is repeated addition of negative numbers. Well, we have already written a good article pointing out the basic differences between a microprocessor and microcontroller. Have a go through for better understanding. 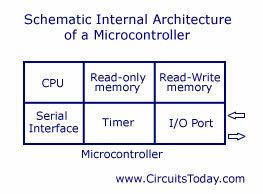 Â Â In most of the embedded systems, a microcontroller is chosen. Because, as you all know, we can call the microcontroller as a mini-computer. The microcontroller integrates many useful components such as memory, timers, counters, ADC, DAC etc onto the same package along with the controller. In contrast,Â for a microprocessor, timers, counters are to be provided separately and memory should also be interfaced separately which involves some additional circuitry and again which eats more space. One of the major goals of embedded system devices is compactness. Hence, embedded system vendors mostly adopt for microcontrollers. This doesnâ€™t mean that microprocessor is less applicable! It is as important as the microcontroller which has its own applications. In general, the microcontroller is designed for a specific purpose. [For example, an automatic washing machine, a cell phone etc. Of course, you can implement the same cell phone with a microprocessor, but it takes too much space and also as much circuitry is involved, more power is consumed.] But microprocessor is designed for a general purpose. The same microprocessor can be used for designing an automatic washing machine and also a cell phone, but thatâ€™s not the case with microcontrollers, its specific for a specific device. In summarizing, we can roughly refer the microcontroller as an enhanced microprocessor, enhanced for a specific task. Many companies such as Integrated electronics, Microchip, Atmel, Philips, Hitachi manufactures microcontrollers. Most notable among them are, 8051 from Intel, PIC series from Microchip, AVR series from Atmel, 68HC11 and HD44780 LCD controller from Hitachi. The PIC controllers are mostly used by hobbyists.Â Some examples of the embedded system worth mentioning are cell phones, air conditioner, car dashboard control, PMPs, robots, scientific calculators etc. Embedded system integrated traffic lights can detect which directions have the highest density of traffic and change the traffic lights and their timings based on this info. This will be a great boon to cities that are controlled by fixed timer traffic lights. IOT (Internet Of Things) is closely knitted with embedded systems. All the appliances of a smart home which can be controlled via the internet are integrated with embedded systems. Vehicles are equipped with embedded systems. Major functions like temperature control (AC), ABS, airbags, automatic rain sensor wipers etc are controlled by these systems. A lot of instruments used in healthcare like blood pressure monitor, scanners, pacemakers etc works with the help of embedded systems. Hardly anything used in advanced engineering is without embedded systems. The applications of embedded systems in today’s world is in numerous. I think it is easier to give you a list of things that don’t use them. Thanks in advance. A much awaited subject. Pls try to make it understandable & usable for even those who are not very strong in mathematics too. goodwork dude..its so easy to understand ur article..than my dumb engineering textbook..good work again.. I am impressed with the teaching language he has used & also explained along with the examples. Yes! Its a nice write up 🙂 Expecting more like this from Anish.